Our family doesn’t have a strong Christmas tradition. 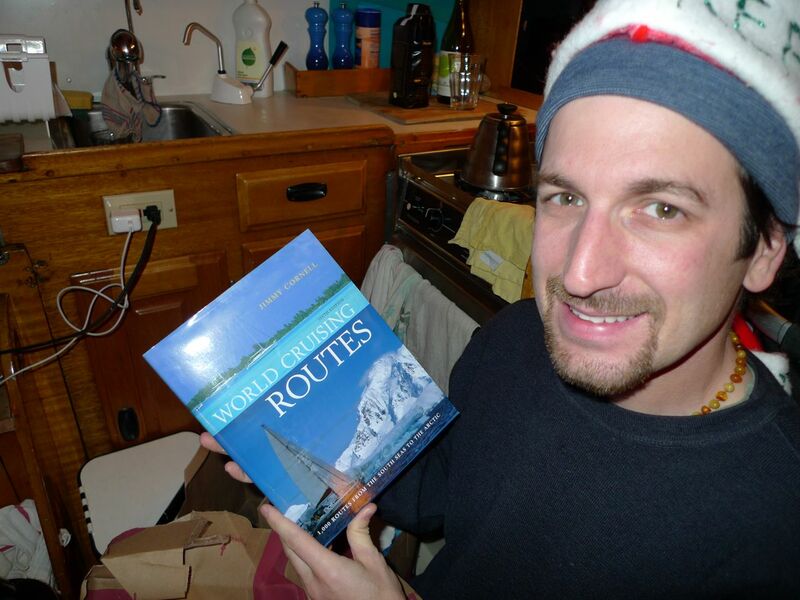 A couple of years ago we celebrated Christmas and a birthday with friends. Last year we opened presents, ate breakfast, and jumped into the car for a big drive to Los Angeles for a week long sailing trip. This year we stayed home on our boat and enjoyed spending time with friends and neighbors in our marina. We decorated Convivia with Waldorf paper stars, white lights, and ornaments on the inside; bought, decorated, and redecorated a tiny tree that fit nicely in the middle of the table; cut dozens of paper snowflakes; lit a peppermint scented candle; and enjoyed the company of our friends in the days leading up to Christmas. This year Ruby asked to go up the mast in the Bosun’s chair with a red permanent marker, so that our mast would look like a candy cane. We loved the idea but thought it would be better with something less permanent, so we spiraled red lights down the mast, hung white lights from the mast head down the fore and aft stays, hung two paper stars from the spreader lights, and two more in the cockpit. We celebrated at the Emery Cove Yacht Harbor’s Christmas party and walked each dock to judge the other decorations in a thunderstorm. The next day we knocked on the Harbormaster’s door first thing in the morning and waited and waited until the votes were tallied. Convivia won second place and a West Marine gift card! Ruby was beyond thrilled. As Christmas approached I got worried about not having handcrafted any gifts this year and worked quickly to construct a Christmas stocking for Miles out of sailcloth found by my friend Amanda outside of Doyle sails. Piles of incoming boxes arrived. 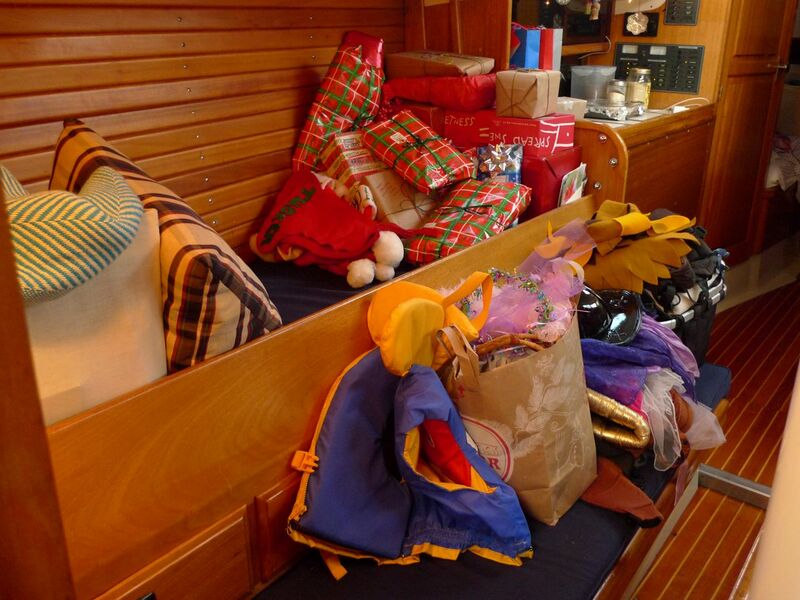 I worked with the kids to identify stuff that could leave the boat to accommodate the presents. The pile in the front was brought up to the truck to deal with later on. Christmas Eve went on and all of the presents got wrapped and piled up in the sea berth for the morning. The kids were delighted with their day. Our first Christmas on the boat was an appropriately tiny affair. How proud and happy was I when Ruby said “this is the best Christmas ever!” So proud. So happy. We settled down for the day in the cozy boat with chocolate from the stockings, homemade granola bars, buckwheat pancakes, naps, face-chatting, phone calls, playing with the new presents, a delicious dinner that took all three burners and the oven, and some cozy time coloring with Ruby after Miles went to bed. Tagged celebrate, christmas, Convivia, decorations, friends, paper snowflakes, paper stars, presents, tradition, tree, World Cruising Routes. We’ve had Waldorf stars on the to-do list for so long. Thanks for reminding me to get in gear and make some! Happy New Year!